Often times we wonder why things go wrong even when there should not be a problem. Most of the problems in the world currently are from people alone. Natural calamities or celestial happenings are so rare and infrequent compared to human atrocities on this planet. At least until human actions are more apparent in showing the damage being done. We are just trampling this earth with so many disastrous things and leaving it in complete disarray for our sons and daughters and future generations. Here are some observations how it is being done and how fast we are making this planet quite uninhabitable. Granted that survival is the biggest force that might be directing human behavior and actions, it is always difficult to estimate what makes us survive. Many times many of our survival instincts are poor and very short sighted. Not all humans are equipped to think long term and those that think of them are in definite minority. How else can we explain this kind of intransigence towards the pollution and it’s disastrous effects? Back in the 60’s I believe the auto-mobile pollution was so bad, there are pictures of Los Angeles showing fully covered in smog and that kind of sights spurred a huge research in coming up with unleaded gas and safe looking fuels. But that only led to a more convoluted problem of this green house gas emissions. 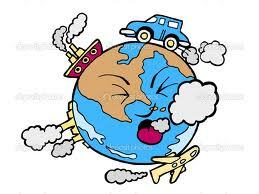 Since it became less apparent and the skies are clear doesn’t mean we are not polluting. We are actually making this even more deadlier because if we see the smoke, we avoid inhaling it but the invisible CO emissions and the micro-pollutants are even more deadly. Did anyone do a serious research on why the cancer deaths are so much more in the last century and continuing to grow? It is because at micro level our cells are being assaulted thousands of more times than during our prior evolution and that is causing havoc on our bodies. In stead of reducing this kind of assault, we spend most of our research in developing cure for it. Prevention is better than cure. How much are we doing to prevent it? I am not saying not to do any research on this, but what is causing this more, now than in the past generations. My great grandfather used to smoke cigars and lived more than 100 years. So why smoking cigars now is definitely linked to cancer nowadays? It means our immune systems are getting systematically broken down by thousands of pollutants that we are filling our surroundings with and bodies defensive mechanism is getting weaker. It is because we don’t mind industrializing and drive ourselves crazy to compete, to outwit or to outdo each other. It is not bad to compete, but is anyone calculating the true cost of doing this? Just because we shift this kind of industrialization to countries like China and East Asia doesn’t mean we are safe. So many coal based factories and industries used to dot the sky of many a city in the west, but gradually phased out in favor of invisible energy like nuclear and gas based but nonetheless would cause different type of pollution. Again it is this notion that if we don’t see the smoke near us we are safe. It is like a cat drinking milk while closing eyes and thinking no one sees me. We postpone real solutions until we hit the wall. Sometimes the wall may crumble and crush so why not see the dangers a little ahead and prepare in advance? The politics of energy is at it’s basest level currently. Politics always rely on short thinking and showing the immediate benefits of idiotic actions. The Oil lobby is at it’s best to besmirch and hoodwink millions of people. It has carefully nurtured a dependence of oil in this country and around the world so that rapid departure from using gas based vehicles is made extremely difficult. It is now a Herculean task now reduce the dependence on fossil fuels and the economy is so dependent on it’s continued use, they made sure it not going anywhere. Even when this country directly knows the terrorists who attacked are grown and groomed in the countries which have vast reserves of fossil fuels, it does not spur and challenge it to produce alternative energies! It is shame US or any other country is a slave of fossil based fuels in this 21st century. In fact it’s foreign policy is warped because of this dependence. Way back in the 70s when there was oil crises, it simply propped up dictators in all those oil rich countries and we all know the consequences of that. The middle east is the most backward in terms of democratic values and human rights. Not until 9/11, USA did not even rethink it’s foreign policy and even then it took sometime to restartegize! Now you talk about human rights and democratic institutions in those countries, that whole region is skeptical of this country’s legitimacy and it’s moral power. It is a digression to talk more about this in this essay. A lot more can be done to limit using fossil fuels, apart from harnessing renewable energies. The most compelling one would be, how we are building the communities. Privacy and freedom have been driven to pervert levels in that, houses are being built far apart and communal interaction is becoming scantier and scantier. This has it’s own problem of crime and the development of reclusive persons who would cause the occasional mass murders with this countries “excellent” gun control measures. But the main point here is that communities are being developed so far and wide in that, it requires more energy and resources to cater to the necessities of them. So about work places. It is time US should scale back in where and how they build the work places. They should be built with proximity to communities in mind. One should even be able to bike to work. And improving mass transit. For regular commute why one needs personal transport! Mass transit is more efficient, less traffic and hence less pollution. The question of having to wait for transport gets minimized if more people use it and more frequent the trips are. It is no brainer, NY and other subways in cities show this already. Why this can’t be done in smaller cities and certainly in city like LA? It is a humbug to say that personal convenience is a human right. Not when you are mucking the living of fellow humans and future generations because of the pollution. Does it take more than common sense when courts strike down any measures to curb lot of unnecessary personal transport? And even for the personal transport system the freeway/highway system built currently is clunky and expensive to maintain going forward. It should be more energy efficient and should have better conveyance system than smoking the rubber on the asphalt. One can have efficient rails or advanced levitation systems to improve efficiency. It takes some initial investment to build these, but we should look forward as to what is needed after 100 years from now. There are countless scientific proposals in this regard. The important point is, this is the time this futuristic infrastructure should be built and to build them we definitely need fossil fuels now! Because down the road, the situation gets more dire in that using fossil fuel anymore and it’s consequences will be more apparent and then people would cringe to use them and hence even more difficult to build this later. There are other types of pollutions ranging from plastic waste to pesticides to genetic mangling of foods to excessive electronics. There should be intense debate and vigorous recycling programs to handle this, as with population growth and of the way how we are evolving to interact these are perhaps inevitable but the true cost of these should be gauged upon based on how it is going to alter the food chain or other environmental cycles. Did anyone understand the true cost of a plastic bag the stores are happy to provide to customers free and it’s life cycle to get back into the eco system without disrupting the natural cycle? Until recently at least, until people realized how difficult it is to recycle them? So why not look ahead a little in advance what can be prevented now? Why wait until we see the smoke and then worry about the volcano then? By the way, human pettiness spans many a different areas, be it thinking about narrow regional, national and cultural views or be it thinking about immediate gains in a stock purchase, a friendship, a relationship or even in family feuds but none can do more damage to humanity than having this pettiness about environmental impacts of human interference.